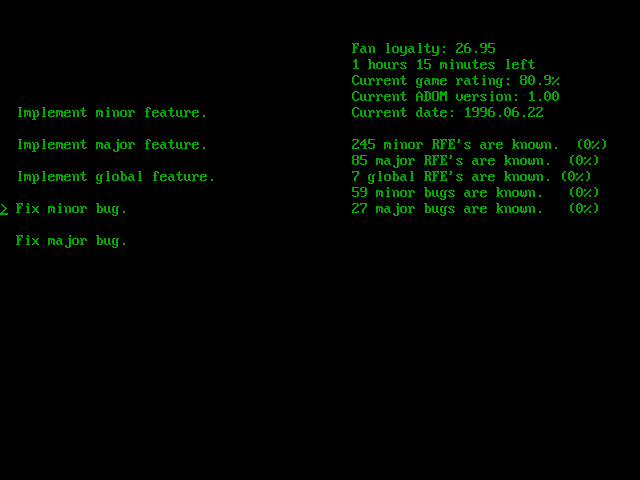 A funny, small simulator of a roguelike developer, in this case based on ADOM. It portraits the typical life of a roguelike developer, getting feedback, checking mail, updating the website, developing features, fixing bugs and managing the fans who slowly lose faith that you are ever going to reach the unreachable version 1.00. There is not much of a gameplay and it's a very short game but if you happen to be a software developer, especially if you are an indie game developer, you might laugh when you notice similarities to your typical day at work.